When eleven-year-old Wataru is told he can change his destiny by entering a magic gateway into another world, he jumps at the chance. But on his quest to find the Tower of Fortune and be granted any wish, he must conjure up all his bravery to battle a world of demons, his own friends and ultimately himself. Are you brave enough to change your fate? The movie was great. 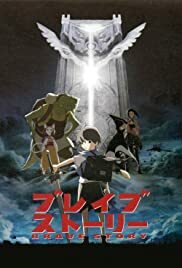 Normally, i'm not the biggest fan of anime, so I did not expected to much of this movie. For that, I am grateful. There was a bit of "Alice in wonderland" vibe to it. In this story you get pulled away from real life and come to a world with beautiful mix animation that stunned me every time. There are a few thing in the movie that are not at a high level. Like the story, it starts real slow. When finally the movie got warmed up, the story gets sloppy and it comes at you as a airplane crashing down and before you know it, it is over. You wanted the ending not to start but like most inevitable things, this ending comes to fast. Therefor i find this movie a great one, not only i was surprised about the mixed animations. Also the moral of the story gets a hold on you. This movie is Walhalla for every anime lover.